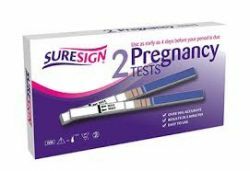 The Reveal midstream pregnancy test is fast, accurate and easy to use. The test is so sensitive that you may use it as early as the first day after you miss your period, at any time of the day. Each pack contains: 2 midstream tests and 1 instruction leaflet. Hold the midstream test by the capped thumb grip with the exposed absorbent tip pointing downward directly into your urine stream for at least 10 seconds until it is thoroughly wet Do not urinate on the test and control window If you prefer, you can urinate into a clean dry container, then dip only the absorbet tip of the midstream test into the urine for atleast 10 seconds. After removing the test from your urine, immediately place the cap over the absorbent tip, lay the test on a flat surface with the test and control windows facing upwards, and then begin timing. As the test begins to work, you may notice a light red flow moving across the test and control windows.